I really enjoyed that. Thanks for sharing your treasures. I read on the Magic Café that the “Mouth sewn up” reference was given by Houdini himself to his imitators. It was one of the conditions he made to everyone who was prepared to challenge one of his escapes. Houdini knew very well that nobody would be prepared to have their mouth sewn up, so he knew he wouldn't be challenged! Thanks Joe. I remember reading something to that effect in a challenge by Houdini to his imitators. Thanks to John Cox for his continual unearthing of all things Houdini. Keep up the great job! 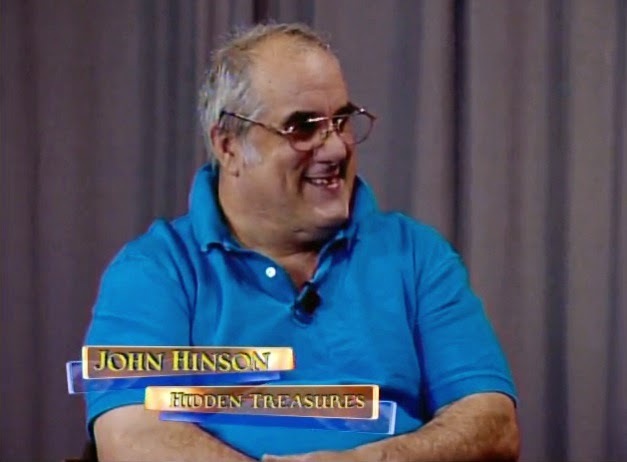 I would also like to give a special thank you to John Hinson for sharing a portion of his Houdini collection with us on Hidden Treasures. I’m pleasantly surprised and always amazed to see something new and exciting related to Houdini. Thanks again to BOTH Johns. I also enjoyed that 30 minute show. Many thanks to you both. This was done on Houdini's birthday? That's great. And you did a great job. Didn't seem nervous at all. I think the host was nervous to meet you! Thank you for your very informative and exciting interview. It’s great that someone like yourself is able to share your collection and information. What a great autographed photo!!!!! Just the tip of the iceberg…Wowzers! My life partner and I have watched this interview on more than one occasion. Keep up the excellent work!!! my name is Ursula Mecklenburg from Germany. My grandmother Maria Hinsenhofen was the sister of your grandfather. My parents died for some time. I found some letters and photos from your grandparents, your father und his sisters and Harry and Bess Houdini. I have no adress or e-mail-contact from you, therefore I contact you on this way. I would be very glad to here from you (my grandcousin). Thank you for the comment, Ursula. I'll make sure John see's this. I'm sure we would all love to see those photos! thank you very much for your comment and your mail. I hope so much to hear something from my grandcousin John Hinson and his family.